With our busy schedules, it’s so easy to get wrapped up in our own lives, and we may forget to give a little extra love to those who truly need it. At The Research Triangle Park, we believe everyone should make space in their schedules and in their hearts to be more giving—not just for the holiday season, but as often as possible. 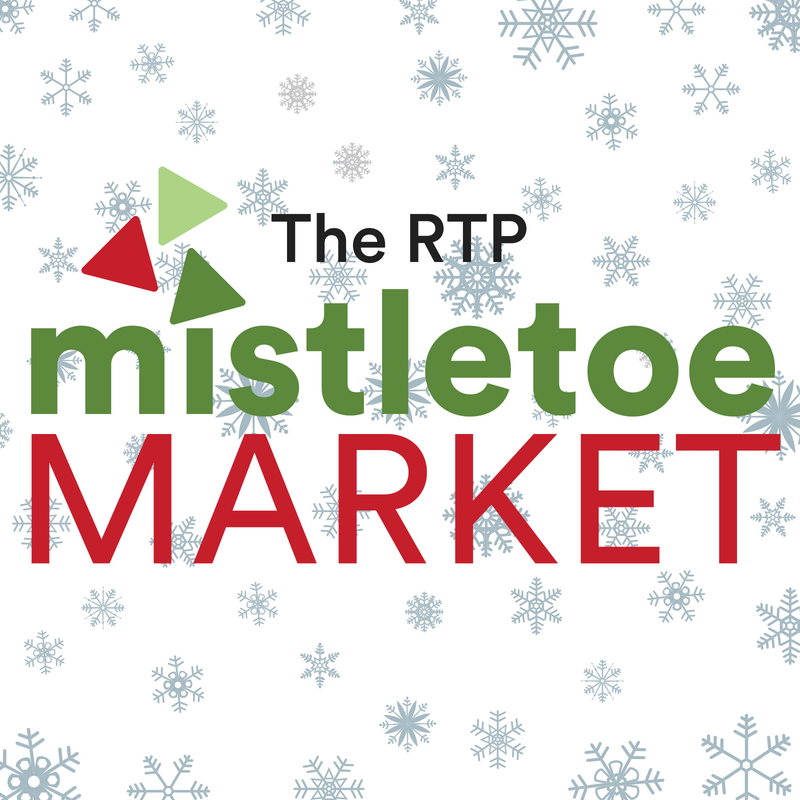 Let our 4th annual RTP Mistletoe Market be your reminder! If you haven’t already heard, December 13 from 4:00 – 7:00 PM (during an extended happy hour) we will be hosting more than 40 local vendors throughout the first floor of Frontier 800 to sell their goods and help us celebrate the holiday season. Plus, 15% of the proceeds made at the Market will benefit Code The Dream, so the gifts you give also give back to our community! #ShopLocal with all different vendors—from jewelry, ceramics, dog treats and more—we have it all! Snag a complimentary beer or glass of wine, grab a bite to eat from one of the delicious food trucks (Arepa Culture and Tenco Coffee Truck) and soak in the beautiful holiday music provided by The Victorian Carolers. Q: Give me a three-sentence elevator pitch about your business. A: Chic and accessible demi-fine jewelry handcrafted in Chapel Hill, North Carolina. Perfectly curated collections for every day and every occasion. Each purchase helps fight hunger through our partnership with local food banks. Q: What is your celebratory dance move when you accomplish something great? Q: Are you a one (wo)man show, or do you have employees? A: I definitely could not do all of this without the help of my husband, who is incredibly smart with all things business and tech. No employees as of yet, but I’m fortunate to get to work with a lot of very talented and wonderful people who have helped with photography, hair/make-up, modeling and a few great friends who are willing to lend a hand at markets! Q: How did you come up with the idea of your business? A: I draw inspiration from seeing a need. For example, my niece and nephew had their dress-up costumes, hats and accessories all over the place. So I made personalized hooks for them to hang up the clothes. Q: Tell us a story about an experience that left you feeling like you had succeeded with your business. A: Every time I sell something I made, I feel like I have succeeded with my business. I love it when people like what I have created. A: I sew table linens using hand block printed fabrics that I source from artisans in Jaipur, India. These 100% cotton (washable!) linens add warmth to the table, help cut down on paper napkin use and are fun. A: Travel, keeping traditions alive, and coming together for meals.